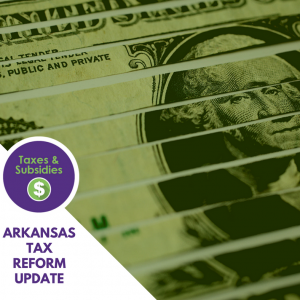 What were the major tax reforms passed by Arkansas legislators during the 2019 session? ACRE Scholar and UCA Assistant Professor of Economics Jeremy Horpedahl and the Tax Foundation’s Vice President of Federal and Special Projects Nicole Kaeding outlined the recent “series of tax reforms to improve the competitiveness of the state’s tax code” in the Natural State in an article published on April 11th for the Tax Foundation. The reforms encompass various parts of Arkansas’s tax code including the individual income tax, the corporate income tax and sales tax. Dropping the corporate income tax rate from 6.5 percent to 6.2 percent in 2021, followed by another decrease to 5.9 percent in 2022. Changing the apportionment factor from a double-weighted sales approach to a single-sales factor, which will favor businesses with a physical location in Arkansas compared with the current formula. Extending the net operating loss carryforward period from five years to 10 years. Requiring remote collection by sellers with more than $100,000 in sales or 200 transactions. Cutting the top income tax rate from 6.9 percent to 5.9 percent in 2021 and consolidating the six brackets into three (although the three sets of brackets based on income level will remain). Other reforms include administrative changes to the franchise tax, a gas tax increase to fund infrastructure, and a tax expenditure review that requires the Department of Finance and Administration to prepare biennial reports about the cost, distribution and impact of each tax expenditure. You can read their full post over at the Tax Foundation here.